How do I restore my original Shopify homepage? 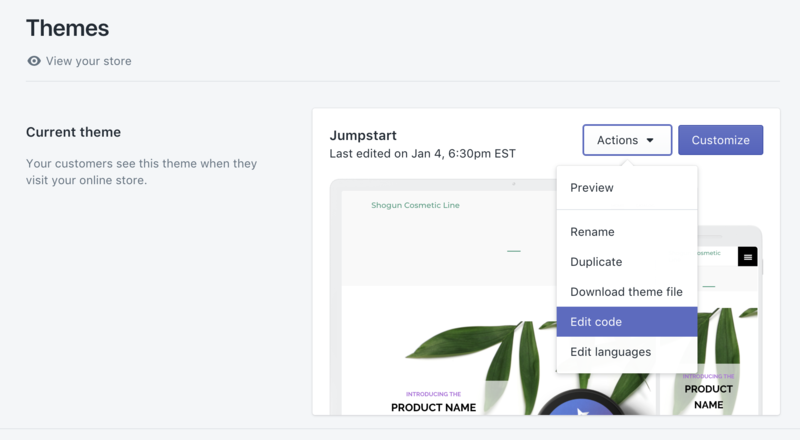 Simple steps to revert your Shopify homepage to the theme's original version. 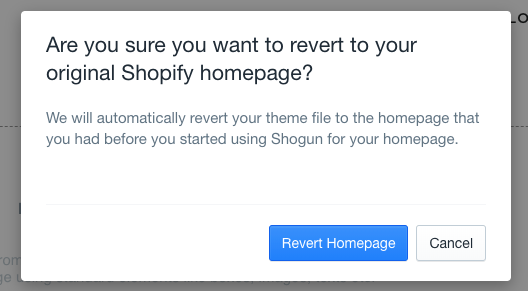 If you've used Shogun's "Set as homepage" button to replace your Shopify storefront and would like to return to the original version, you can do so with just a few clicks. We have two methods of reverting your home page to its original state. The automatic method for unsetting your home page can be found in your dashboard. Once you have a page set as your homepage you can then revert your homepage by clicking on "page options." Click on the "Revert Homepage" button, and then follow the prompts. You will have successfully reverted your homepage. Note: "Set as homepage" is a new feature to Shogun. In the meantime, these steps can be followed if the automatic method is not appearing for you. Open the index.liquid file in the Templates folder. Click on the Older versions link that appears next to the file name. That link will allow you to select an earlier version of the index.liquid file. The version labeled Original is the default template that came with your theme. Select it and click Save. Your theme's original homepage will now be active. Note: After you've manually reverted to the original storefront, the Shogun page may still have a "homepage" tag next to it on the dashboard. This is only an indicator tag and does not mean it is active as the current homepage on your store. The tag will remove itself when the "unset homepage" feature is released.